Drums can be a very personal thing. 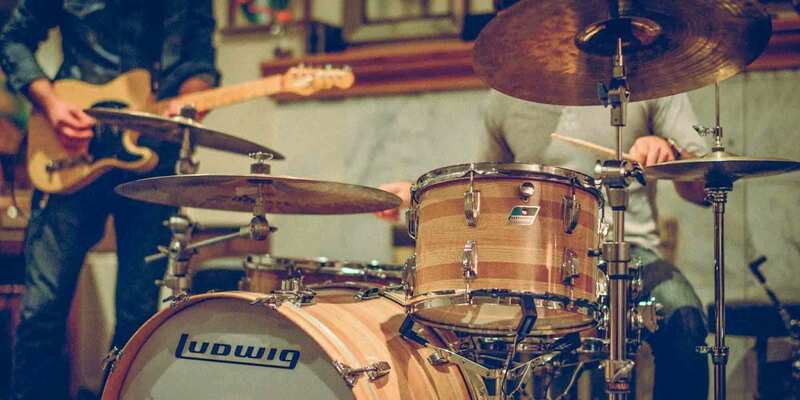 Each drummer has a certain sound that they aspire to, certain sticks they prefer, and certain cymbals that make them feel most at home behind their kit. 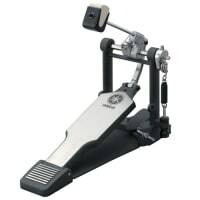 Though often overlooked, one of the most personal parts of a drummer's arsenal is easily the bass drum pedal. 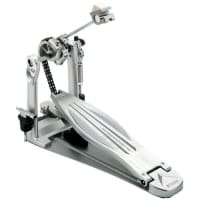 To a non-drummer, this may just seem like a simple piece of hardware that makes the bass drum go thump, but modern bass drum pedals can be adjusted and customized to make them as unique as the drummer playing them. 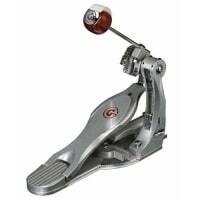 The last few decades have seen a veritable industrial revolution in the technology of the bass drum pedal. Where we used to have really only two or three choices in pedal design, with every major manufacturer making their pedal relatively that same way, we now have a plethora of pedals to choose from, with companies that specialize in bass drum pedals, rather than just making them as an accessory to the drums that they sell. To make the process of deciding on a pedal a little easier, let’s go over a few of the most common options and adjustments to look for when choosing your pedal. Direct drive is when you have a solid piece of metal that links the footboard (the piece that your foot rests on) to the cam (the part that rotates). As the name suggests, this provides a direct link between the motion of your foot and the motion of the beater and will give the fastest response and largest amount of power from the pedal. This will also cause the footboard to return to its original position faster than the other options. Direct drive is often favored by heavy rockers and metal drummers, due to its speed, power, and durability. Chain drive is when there is a chain in place of the single metal shaft connecting the footboard and the cam. This option, while still fast, will give a slightly smoother feel to the operation of the pedal than direct drive and is often the favorite of the all-around player. Strap drive uses the same design as chain drive, but uses a nylon, leather, or reinforced rubber strap in place of the chain. This can give the pedal a slightly “bouncy” feel and make playing feel more organic. The cam is the part of the bass drum pedal that controls the acceleration of the beater into the drum head. Think of this as your pedal’s transmission. There are basically two different cam shapes: round and oblong. A rounded cam was once the most common and popular shape, as it provided the same force throughout the movement of the pedal. This is a great option if you are playing a variety of musical styles and demand absolute dynamic control at all times. An oblong shape to the cam will provide more force the further the pedal is depressed. This is like putting your transmission into overdrive, as it multiplies the amount of force that your foot puts into the pedal as it is transferred to the beater, making the pedal faster and more powerful. This cam shape has become more and more popular as modern musical styles have demanded a stronger and stronger presence on the low end. Whether the drums are for you or someone else, we help you look for the right things and choose the kit that fits. As the name implies, the footboard is the piece of the pedal that your foot rests on. The length of the footboard can affect the amount of leverage that your foot provides while playing, in turn affecting speed and power. The more traditional footboards have a small portion that is parallel to the floor and remains stationary. The remaining part of the pedal is the part that is set in motion by your foot. These footboards don’t provide as much leverage as their full-length brethren, and are favored by those that like more resistance from their pedal. Longboard pedals have a footboard that runs the full length of the foot, providing a longer lever, and thus, more speed and power. These longer plates also allow you to use “heel-toe technique” to create the faster bass drum patterns associated with today’s metal and prog rock rhythms. 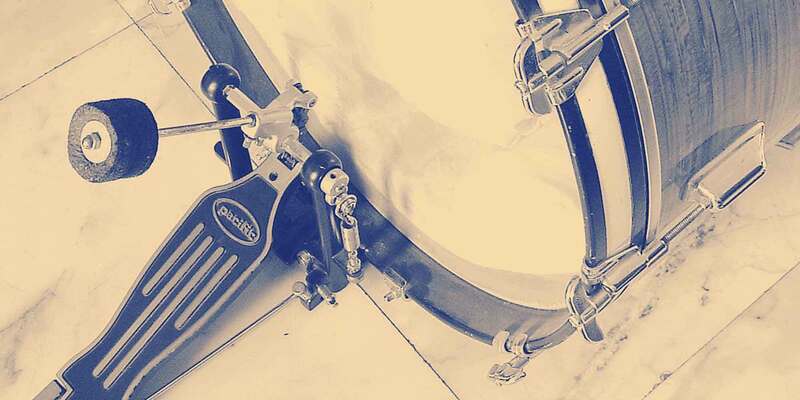 Now that you know more about the anatomy of a bass drum pedal, you are probably thinking to yourself, “What pedal should I buy?” Some of the more popular options are listed below to give you a starting point. While these are many of the choices that are out there, they are certainly not all of the choices. It's always seeing if you can try out a few options, and don’t be afraid to check out some of the vintage gems, such as a Ghost pedal or a Ludwig Speed King. 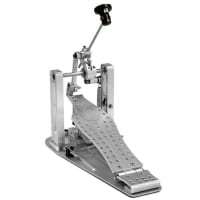 Drum Workshop, or DW, has been one of the industry leaders in bass drum pedals for many years. Their pedals are often thought of as the industry standard and continue to be one of the most popular choices among drummers across all genres. 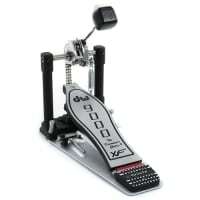 The DW 9000 pedal is one of the most adjustable and durable pedals out there. It has an infinitely adjustable cam, which can be adjusted with a drum key, allowing for a very easy customizability of the pedal without taking the pedal apart. This pedal also has the ability to change from a chain drive to a strap drive, meaning that if you don’t like the feel that the current drive has, you can change it down the road without having to buy a new pedal. The only drawback to this pedal is the high price point. This pedal is often sold for around $310, so if you’re on a budget, this one might not be for you. If, however, you are looking for a solid lifetime investment, look no further. 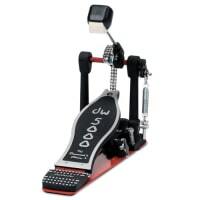 Another solid option from DW is the 5000 Series pedal. For many years, this was the pedal of choice for many of the top drummers in the world. There are two different cam options available: a round cam for a smooth, even feel, and an Accelerator TM cam that is offset to speed up the beater during its motion toward the bass drum head. While not quite as adjustable or as smooth as the 9000 series, this pedal does sell for about $100 less, making it a very competitive option. 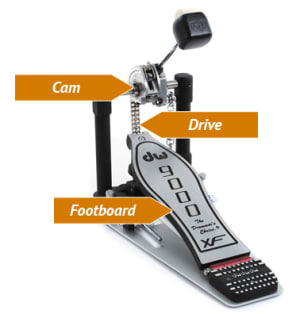 DW also recently came out with their first direct drive pedal, the DW MDD. MDD stands for Machined Direct Drive. This pedal is made of machined aircraft grade aluminum, making it extremely durable, and features an adjustable connection between the drive bar and the drive shaft, giving it the same variable feel that the 9000 series does, but with the straight forward feel of the direct drive. A unique innovation of this pedal is that the spring tension is adjustable via a screw on the side of the pedal facing the drummer. With a drum key, the spring tension can be easily changed to suit the playing situation, rather than having to reach under the pedal and twist a nut with your fingers. The beater also has weights that can be added to or taken off of the head of the beater, giving even more versatility to the pedal. 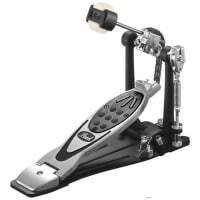 Mapex’s top of the line pedal is a highly adjustable pedal that can work for just about any situation. The Mapex Falcon pedal comes with two interchangeable cams, one rounded and one offset, and an interchangeable chain and strap drive system. These features allow the pedal to be set up to just about anyone’s preferences. In addition, the footboard and beater angles are independent of each other and there are different weights that can be added or taken out of the beater, giving a near infinite range of feels that will suit any player’s needs. The next step down from the Falcon is the Armory Series hardware. This hardware is designed to be a no frills, road worthy line of pedals and stands that will stand up to the normal wear and tear of a gigging musician. The armory pedal only comes in a chain drive with no interchangeable cams and does not have independent footboard and beater angle adjustment. As stated, this pedal is a no frills, get the job done pedal and at right around $100, the deal is hard to beat for such a solidly built piece of hardware. Tama entered the pedal game in 1993 with the Iron Cobra, a pedal designed with speed, power, and durability in mind. The current version is available in three models: a chain driven, rounded cam model, a chain driven offset cam model, and a strap driven model. Each offers the same amount of adjustability and durability, and it really just comes down to which feel you want. At around $180 new, this pedal falls into the mid to high price point, but can last for your entire career. There are also plenty of used deals out there on Iron Cobras. 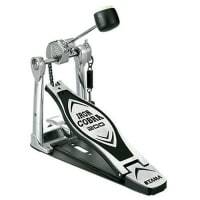 A newer addition to Tama’s stable of pro grade pedals is the Speed Cobra. As you might imagine, this pedal is designed with speed in mind. The long, smooth footboard allows for the use of heel-toe technique to create faster rhythms, and the footboard is set farther back from the camshaft to create a greater speed to effort ratio. The patented Cobra Coil spring also helps to push back on the bottom of the footboard to help liven up the footboard response time. For those that want to rock out hard and fast, this is the pedal for you. The Pearl Demon, or P-3000, is Pearl’s top of the line pedal and ranks right up there with the best on the market. The direct drive version of this pedal features a two position adjustable drive that can give it the feel of either a round cam or an offset cam, while the chain drive version of this pedal has a round cam to give it a smooth, even response. The beater stroke is adjustable in a way that gives it the same amount of flexibility that the variable weight beaters of the Mapex, Tama, and DW pedals do. The really cool thing about this pedal is that it can switch back and forth between a longboard pedal and a traditional shortboard, allowing for people that prefer the speed and leverage of a longboard, or just people with really big feet. At about $300, it is a bit of an investment, but it very well may be the last pedal you ever buy. The Powershifter Eliminator, or P-2000 was a revolutionary pedal when it was introduced, and it is still one of the top pedal choices on the market today. This pedal comes with six differently shaped interchangeable cams and a beater with four different faces, giving it a wealth of different feels and sounds when striking the bass drum. The pedal is available in either a chain or belt drive, and at around $200, is a steal for such a versatile pedal. Sonor’s new Perfect Pedal by Jojo Mayer is one cool pedal, but it might not be for everyone. This pedal is only available with one cam shape and is convertible from strap to chain drive with no direct drive option. The pedal is, however, very smartly built. The pedal uses non-proprietary parts, meaning that all of the screws and nuts are threaded and sized so that they can be replaced with something that can be picked up at your local hardware store. The pedal also folds up with the push of a button, making it easy to store and carry, and it doesn’t take up too much room in your hardware case. The rounded cam, particularly when paired with the strap drive, gives this pedal a light, bouncy, and responsive feel that is perfect for jazz or fusion. Utilitarian is the word that best describes the Yamaha P-9500. 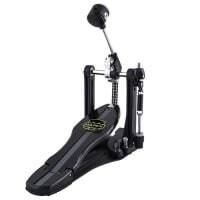 This is the Honda Accord of bass drum pedals. The pedal is built to function for anyone and everyone, and built to last. The frame has a stabilizer bar that is built into the frame to keep the bearings aligned and keep the pedal functioning the same, no matter what the circumstances. 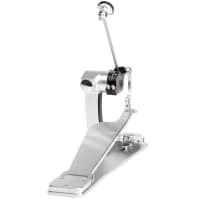 The beater angle and footboard angle are independently adjustable, making the pedal suitable for a wide variety of players, and there are both a direct drive and an interchangeable chain/strap drive model allowing for a mid-price range pedal that can please anyone. Gibraltar, unlike the rest of the companies, whose pedals have been profiled so far, is just a hardware company, whose pedals range from innovative and top of the line to simple and solid. Their top pedal, the G-Class, comes in only chain drive and has a two position cam, independent footboard and beater angle, and interchangeable beater weights, giving it a fair amount of adjustability. 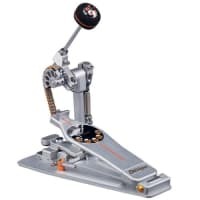 The cool thing about this pedal is the Helix mounting system, which attaches the pedal to the bass drum hoop via a single point ratchet drive lever, rather than the traditional wingnut. This makes the pedal easily mountable and easily stowed away, perfect for a drummer that goes to a lot of jam sessions and likes to bring their own pedal with them. The Avenger is Gibraltar’s go-to pedal for those that want a no frills pedal that is adjustable and will get the job done. This chain drive pedal has independent footboard and beater angle adjustment and costs only around $70, making it an ideal first pedal. 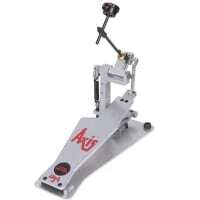 Axis percussion is one of the front runners in the direct drive, machined aluminum world of bass drum pedals. Their A-Series pedals feature an adjustable drive system that changes the amount of power that the beater has and changes the feel that the pedal has under your foot. Both of their top two lines of pedals, the A-Series and the X-Series come in both traditional and longboard versions, creating pedals that can be used in virtually any situation. The difference between the two series being that the X-Series does not have the adjustable drive system. The machined aluminum construction makes a smooth, consistent feel and a supremely durable pedal. These pedals have been favored by many in the rock and metal worlds for the last 25 years due to their speed, power, and durability. Trick percussion has created what could be considered the most innovative pedal of all due to one simple modification. Their pedal is equipped with a compression spring, rather than an extension spring, giving the pedal a supremely smooth feel. This compression spring does feel a little different and can take some getting used to, but it does offer more adjustability and a smoother action than its extension counterpart. The tension of this pedal can also be adjusted on the fly via a simple knob on the front of the pedal that does not require a drum key. 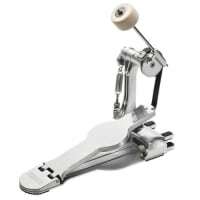 The rest of the adjustments can be made using only a drum key and do not require an allen wrench, as on other top of the line pedals. 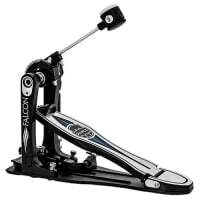 Trick Pro pedals are by far the most durable and adjustable pedals on the market, but they are also the most expensive pedals on the market, weighing in at about $400 for the single pedal and $850 for the double pedal. If you are willing to get used to the way the compression spring feels, then the money is more than worth it for this great pedal. While these are not all of the pedals on the market, they are some of the most popular pedals and should give you a great starting point in your quest for the perfect option. Like guitarists with effects, chances are you'll crave a new pedal sooner or later, and Reverb is here to help with your future experimentation as you add new components to your kit.